Those obnoxious-voiced GPS units that often lead drivers to closed streets or down bizarre paths may be helpful, but they’re not exactly fashion accessories. 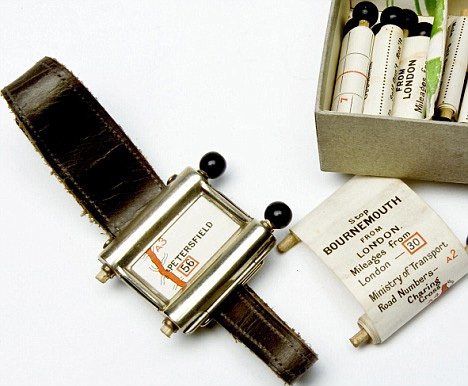 Their predecessor, however, was this utterly delightful analog device that strapped directly to users’ wrists. 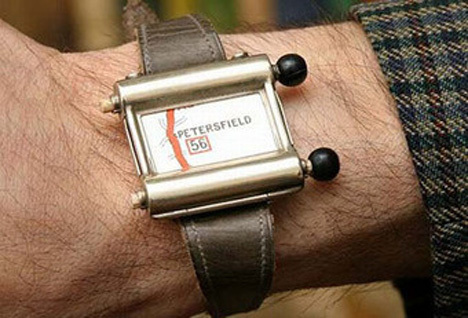 It was called the Plus Four Wristlet Route Indicator, and it dates all the way back to 1927. According to the National Trust in Britain, it was the first navigation device made expressly for motorists. The small watch-like device held a paper scroll, on which was printed a map with the route between two cities highlighted. Drivers simply turned one end of the scroll as they progressed, and when the scroll reached its end it could be swapped for another. The device came with 20 scrolls, and was probably much less of a pain than unfolding and trying to decipher endless maps on the side of the motorway. See more in Antique Gadgets or under Vintage & Retro. January, 2010.